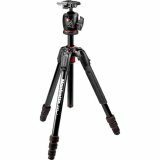 The Manfrotto MVH500A Fluid Drag Video Head with MVT502AM Tripod and Carry Bag features a a fluid head with a wide platform to support the HDSLR form factor, and a 60 mm half ball for quick leveling without adjusting the legs. 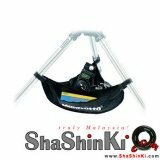 The head supports a maximum weight load of 11 pounds and has a built-in pre-set spring-loaded counterbalance of 5.3 pounds. 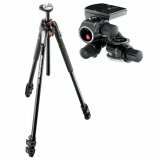 It features a tilt range of -70°/+90° and it provides 360° panning rotation. The head also features a side lock system for the sliding QR plate, and an integrated bubble level. 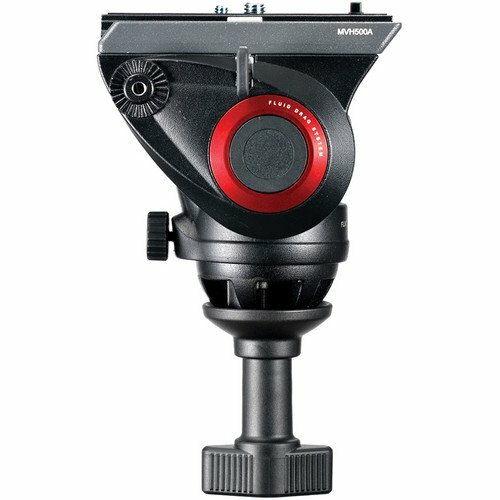 The 2-stage tripod feature a 75 mm bowl and includes a 75 to 60 mm adapter so you can use the MVH500A head. 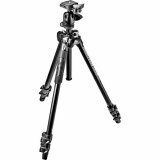 The legs are individually adjustable, and feature a mid level spreader for stability on uneven ground. 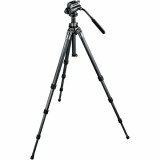 The minimum height of the tripod and head is just over two feet, for getting low angle shots, and the maximum height is just over 5 feet. The legs feature non-removable feet suitable for exteriors and interiors, and are gentle on delicate floors. 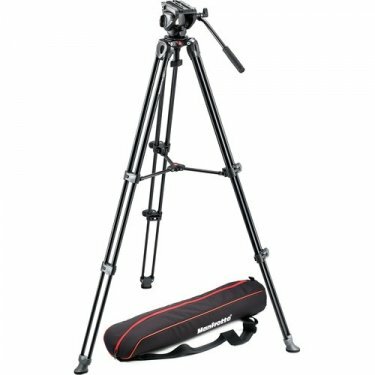 The included padded carry bag makes transporting your tripod and head simple and easy. 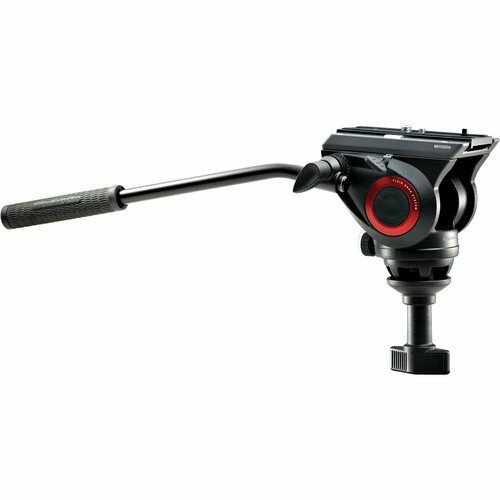 The wide camera platform provides support for DSLR cameras, making this head suitable for both camcorders and DSLR cameras. The 60 mm half ball allows you to quickly level the head without having to readjust the legs. It also makes it simpler to create dutch angled shots without dangerously unbalancing the tripod. 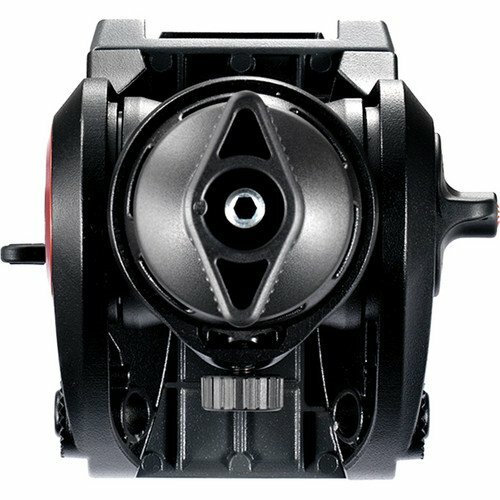 The spring loaded counterbalance is fixed at 5.3 pounds, however the head supports 11 pounds, and the counterbalance will still provide assistance when using camera set ups heavier than 5.3 pounds. Professional fluid cartridges provide fixed fluid drag in both the pan and tilt axes. The head features a tilt range of 90 degrees forward and 70 degrees back, allowing you to tilt the camera straight down, and tilt it almost straight up. The head pans through 360 degrees, allowing you to take long panoramic shots or spin the camera around on the head. The side lock system allows the sliding QR plate to click into the head from above, instead of needing to be aligned and slid in from the back. This gives you the speed of a touch and go quick release with the balance adjustment capability of a sliding QR plate. An integrated bubble level on the head aids you in quickly leveling the fluid head. 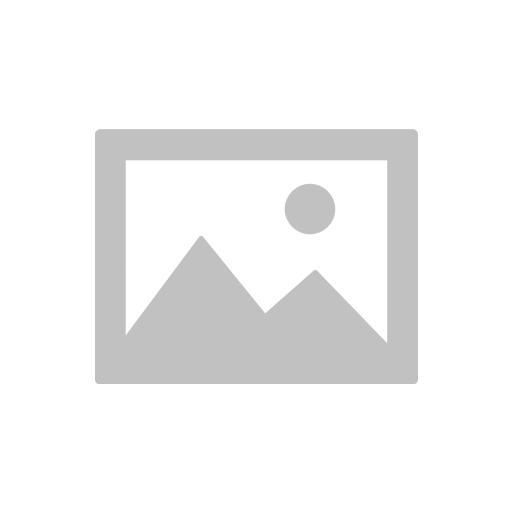 The included 500PLONG sliding QR plate also includes both a 1/4"-20 and 3/8"-16 camera tie down screws. The head includes one pan bar, and features two pan bar mounting rosettes, one on each side of the head, for left or right handed operation. A second optional pan bar allows you to operate the head with two pan bars at the same time. The Easy Link connector, is a 3/8"-16 threaded hole in the side of the head that allows you to easily mount accessories to the fluid head itself, and not the camera. 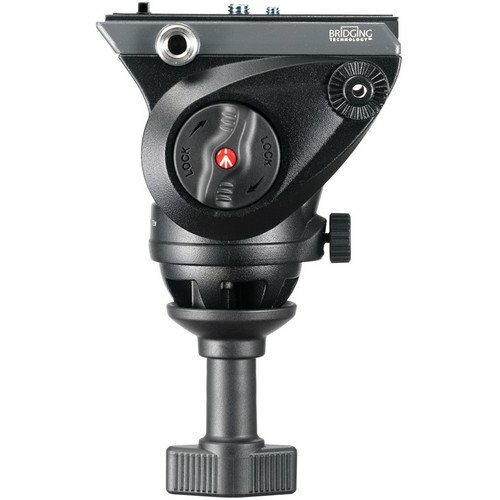 Featuring a 75mm bowl for attaching a fluid head, a 75 to 60 mm adapter is included for using with the MVH500A head. 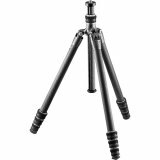 The tripod legs can support over 33 pounds, easily carrying the weight of the fluid head and camera. 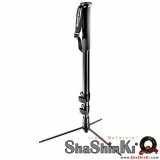 The closed length (without fluid head) is just over two feet, and has a height range of 22.4 to 56.5 inches and weighs only 4.3 pounds. 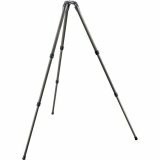 The legs are constructed out of oval aluminum tubes for strength and durability. Each leg can be independently raised and lowered when required. The mid level spreader helps prevent instability that a ground level spreader can introduce when working on uneven surfaces. Non removable rubber feet provide secure grip, and are gentle on delicate surfaces, such as interior floors. An elastic leg strap helps keep the legs secured together during transportation and storage. The padded carry bag, keeps your tripod and head together during storage or transport. VIDEO HEAD MVH500A Very well made fluid video head. 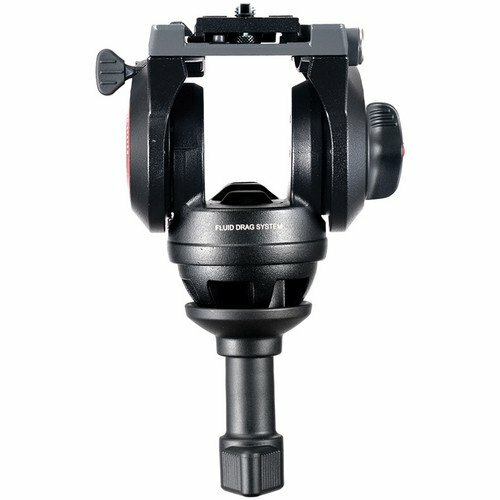 Since MANFROTTO is one of the largest fluid head manufacturer, I choose them instead of BENRO due to its quality and durability and price. The head is quite heavy although it is stated it is made of aluminium. The fluid in the head works perfectly. Love the smooth panning and tilting which is great for video works. Also can be used as a photography head due to the 75mm (also have 60mm half ball adapter) system to adjust the head with needing to adjust the tripod legs. 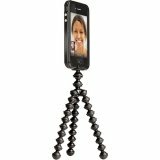 Easy and quick if you want to capture the perfect shot. The lock mechanism which the newest feature is my favorite. 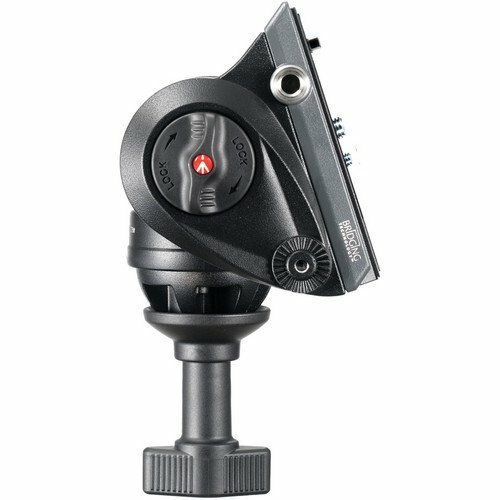 Instead of sliding your camera setup from back to front (vice versa) like other fluid head in MANFROTTO, you just press on the lock, and lift your camera at a 45 degree angle. This allow me to quickly release my camera setup without needing to slide all the way back and putting it back is not easy if it have to slide. My rating; 4.5 stars. 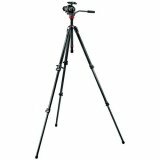 TRIPOD MVT502AM I love the design but it is quite bulky when folded compared to other tripods. However, with the double tubing on two legs, it can add stability to your setup. The center spreader is not easy to spread maybe because im not used to that kind of spreader but it works as it should. Plus it add more stability on uneven ground. 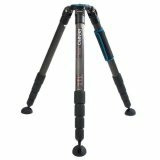 The tip of the tripod does not have a pointy end like most high end tripod but with padded end it can make this tripod the most stable tripod yet. Good for video work.Comes free with a carry bag. My rating; 3.5 stars.